Arriving in Namibia many moons ago as a free man, not on any anti-depressants but with lots of hair and muscles, weekends were open for enjoyment. As a novice birder (2 months), I decided that Etosha should be the first place to conquer with my new-found knowledge and enthusiasm for the world of birds. Since I had been in the country for just one month there were a few birds to discover, over 600 to be more precise. 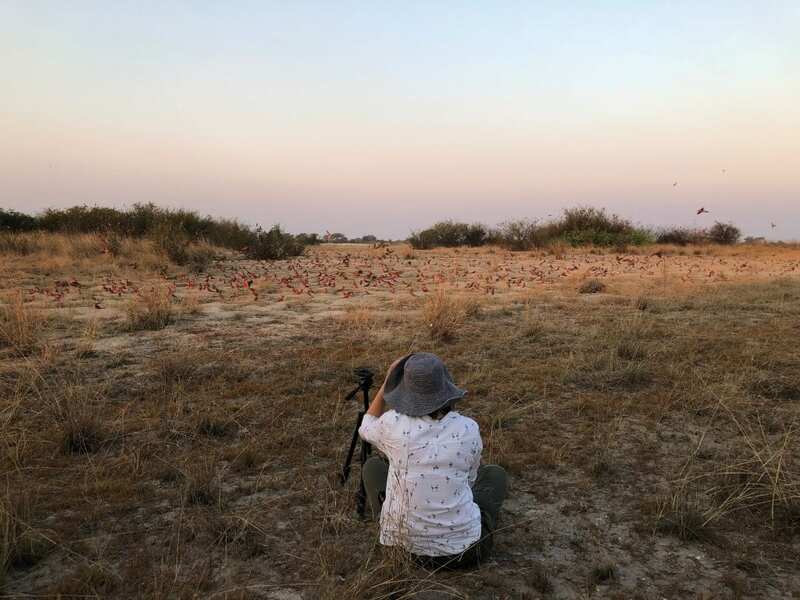 Without wanting to bore the reader with the "wel en weë van (ups and downs of) die blou bul birder" this might be of real importance to any novice Namibian and birder. The Nyae Nyae Pans in the east of Namibia were filled up after good autumn rains. Stories abounded of lions that roamed the open grasslands. 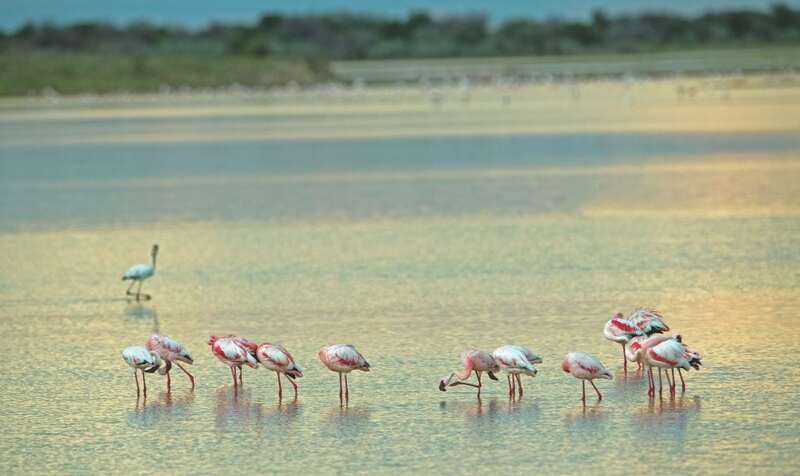 Of a massive flock of flamingos that had descended on the water. One word: paradise. If there were a lion behind every second bush, or a leopard in every tree, would they be so special? Would photographers want to shoot them (to protect them), would photographers drive off-road or into a no-entry road to get a better angle on their million dollar picture? I have in fact seen people drive all over each other to get a closer look at a lion, to get to the front of the scene of the crime. Imagine, for a lion! Luckily no photographer will ever do that. The point I want to make about starlings is that they are too common. Most of the starlings have a metallic sheen flashing back when the sun touches their feathers, but unfortunately they are not so special because they are just too common. This might be where this terrible word is coming from: ‘common’, like too many seen too often. Possibly it is also because they are robust and gregarious. Let’s rather call them plebeian. Cranes are universally regarded as symbols of peace and good luck. 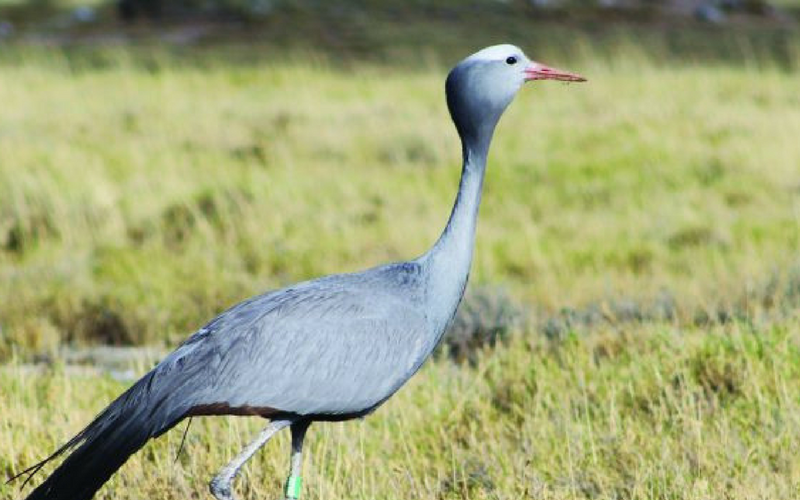 There are 15 species worldwide, with the bulk of the Blue Crane population found in South Africa. A small outlying population in Namibia is described as being among the most mysterious of all cranes. 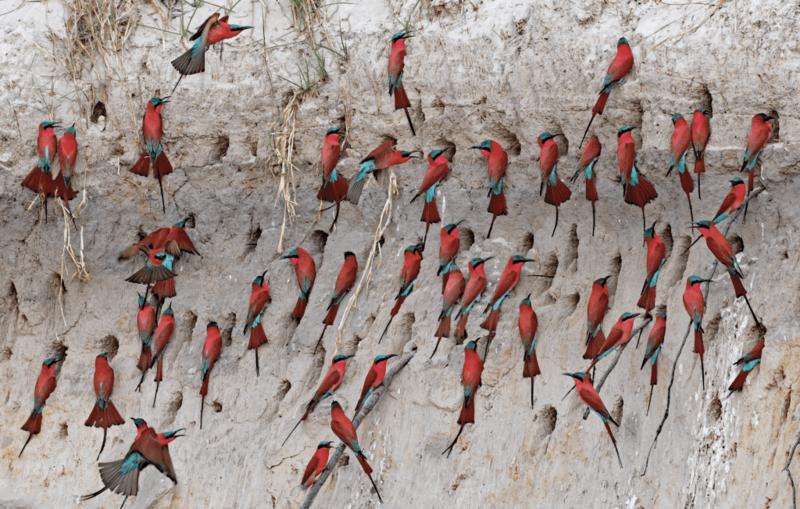 Birding on the Chobe floodplains is like falling into a big bowl of ice-cream, without the negative side effects of eating too much of it. Being a boatman for a bird watcher or bird photographer must be exhausting. Stopping every few metres for yet another bird. Imagine how tiring it must be for the photographer! Contrary to popular belief, storks do deliver babies to new parents. The only inaccuracy in the myth is that while it was initially thought that only White Storks were involved in this malpractice, it is now a well-known that, in fact, there are also other species in Namibia that take part in this activity. If you ever thought endangered species have problems, you ain't seen nothing yet (if this sounds American, well it is as big as the U.S.A Trump card). We are indeed in the process of cutting off the wings of these birds, and no, we are not talking Penguins. On 22 August, give or take a day or two, the carmines arrive in their thousands to do their annual breeding thing at Kalizo. With great expectation and anticipation, Kalizo is on fire for this incredible happening every year. However, like in-laws, their departure is not that predictable, taking place from early November until late December. 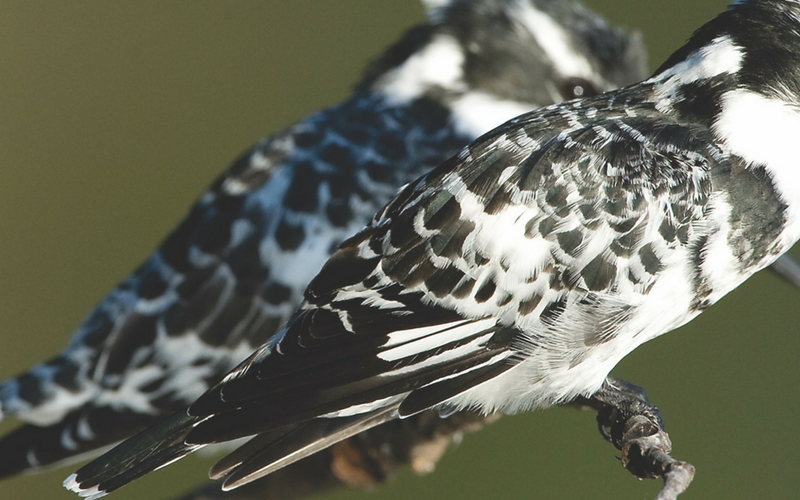 Of all the bird species this is probably the one that even the most novice bird watcher can identify. Firstly, the type of species that you are looking at is a goose/duck/teal, and secondly, to differentiate between the various species is rather easy. To say that for me it is not a problem to identify them might sound a bit blasé after 35 years of birding, so I would rather say even my son Ian can make the correct diagnoses. Going into the gory detail about their habitat in and around water, it is not rocket science that they have a funny looking flat bill and funny looking webbed feet. 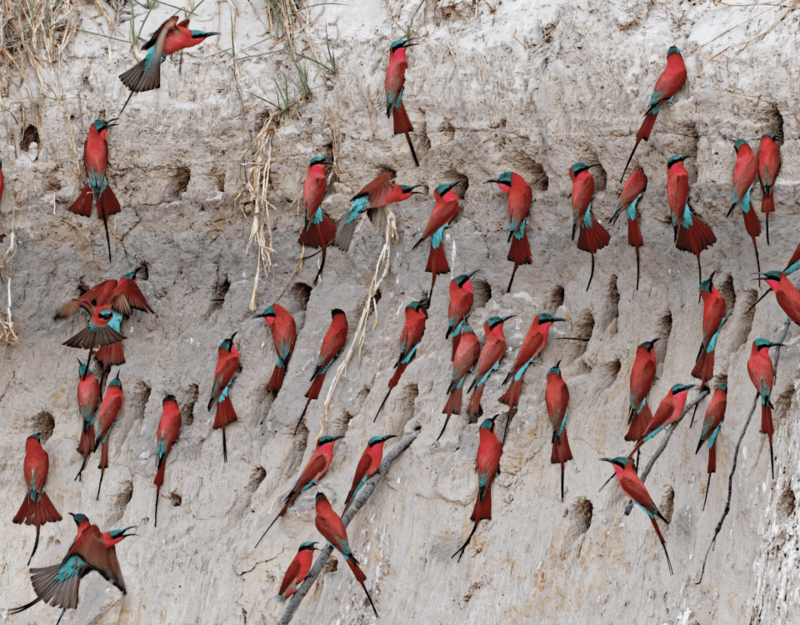 These master builders live in northern Namibia from Rundu in the west to the Zambezi Region in the east around marshes, rivers and dams with thick grass and reed beds and papyrus (Cyperus papyrus).